Our blog about what we are doing at our school. What is the Key to Bridgeview Montessori's Future? Lenore Lyons and the Key Idea will be celebrating Peace Day with us on April 9 and 10th. Pictured above, Alexa as Edwina in Bridgeview Montessori’s production of Dear Edwina ,Junior consoles a young friend played by Maggie! Learn what a recent graduate taught us when he spoke to us at Bridgeview Montessori’s graduation last year. Our Head of School shares her top twenty list in this 20th year! Please enjoy our first blog post written by a Bridgeview Montessori parent, Leslie Dominguez Santos. Our hope is that other members of our community will be inspired to submit blog posts that celebrate children, learning, Montessori education, parenting.....whatever inspires your voice. Thanks in advance for sharing. Thanks to Leslie for being our first voice! I worried about my son, Tony, completing his Sixth Year Project. Intensive research, lots of writing, and the creation of a year-long masterpiece all sounded really challenging for my son who doesn’t always love schoolwork. Yet, this Thursday, Tony will present his fifteen-page research paper and perform his Sonatina in G Major, Opus 1, composed in the Baroque style. It is an amazing feat, and yet another reason for me to be grateful to Bridgeview Montessori School. Tony has always loved music. His EI teacher, Melissa, quickly realized that he focused better if he was allowed to play on the piano for a few moments in between works. Courtenay realized that following the lead of this child meant giving him musical challenges like performing for peers, at the Winter Concert, and with the All-State Choir. His private piano teachers have nurtured his passion. Kathleen and Jolie knew that studying Baroque Music was a perfect topic for his Senior Research Project. In true Montessori fashion, his teachers helped Tony devise a work-plan for his project. They broke down the project into very manageable pieces. There was the right combination of hand holding and firm pushing. Sources were gathered. Research began. Interesting tidbits about Baroque music revealed themselves to him. His enthusiasm for what he was learning brought him to new studies in his piano lessons. Perhaps the most amazing part of the experience for Tony was the interviews. Tony worked hard to identify a Baroque-style musician, a composer and a conductor to interview. The simple act at Bridgeview Montessori School of teaching children how to shake hands and look someone in the eye was invaluable for these experiences. And, the Montessori confidence of speaking up and representing yourself was on full display in his interviews. Stars grew in his eyes with each interview. After each interview, his dreams grew: conduct an ensemble, compose music, play the harpsichord. One of Tony’s interviews was with the international harpsichord, Ian Watson. The interview went incredibly well when Mr. Watson realized that Tony not only played the piano, but truly understand (thanks to copious research) how the harpsichord worked. At the end of his concert, Mr. Watson invited Tony on to the stage of Jordan Hall to perform on the harpsichord. Big dreams were made. Tony’s final project is his Baroque-style composition. Were it not for this project, Tony would not have delved into the world of composition. He realized how challenging composing is. Yet, he also realized how enormously satisfying it is to take the music he hears in his head and shape it in to something. The project was a gift. I write this, in many ways, as a thank-you. Tony will soon graduate from Bridgeview Montessori School. He is well-prepared, enthusiastic, resourceful and determined as a result of his years at Bridgeview. Follow-the-child worked for him: starting with Melissa letting him do spelling with tiles because he refused to write and ending with an E II presentation of 15 pages of research and writing. Thank you for letting Tony lead his way through his Elementary years. Thank you for nurturing his passions, letting him learn from mistakes, guiding him in time management and patience, and teaching him how to learn. I know that graduation isn’t until June; but, the completion of this projection and the founding of these new passions – that is his true graduation. For close to 10 years now, Bridgeview Montessori student poets have been entering their peace poems in the Voices of Peace Poetry Contest sponsored by the Veterans for Peace, Cape Cod and the Arts Foundation of Cape Cod. Once again, Bridgeview Montessori students fared well in this competition. Please enjoy these award-winning pieces. Thanks to all of our students for participating in this event. And, a special thank you to the teachers who supported our poets, Melissa Berbine, Danielle Gaskill and Jessica Germain. Peace looks like a puppy crawling in the snow on a winter day. Peace sounds like a kitten purring on your lap as you pet it. Peace smells like cookies baking in the oven on a rainy day. Peace tastes like fudge swirl ice cream in a bowl at my birthday party. Peace feels like a baby chick in my hand at a farm. not to be taken advantage of. for everybody to feel, hear and be. And together we can keep the world a better place. For every man, woman and child. Peace looks like a sparkling waterfall splashing in the autumn light. Peace sounds like light and flowing lullabies in a cozy bed. Peace smells like lavender mist floating in the air. Peace tastes like warm gooey cookies right out of the oven. Peace fells like a warm cozy fire on a cold winter night. What is all the hype about STEM? Lately it has become a catch phrase for schools to prove they are on the “cutting edge.” The combination of Science, Technology, Engineering and Math is not a new thing, however. Maria Montessori incorporated these into her programs even for the youngest children. So many of the classic Montessori lessons involve the tenets of scientific practices: from the precision of pouring, the construction of the pink tower, the evaluation of length with the box of sticks, the classification of vertebrates, the organization of animal life cycles. Montessori believed in cultivating the scientist in each child through curiosity and structured activities. By the time students make their way to our Elementary II classroom (traditional grades 4 to 6), they have had countless lessons to develop their skills of formulating questions, observing, evaluating, categorizing, experimenting, and expressing ideas. They are ready for further opportunities to follow the scientific procedure, guided at first until they achieve independence. The annual Science Fair at Bridgeview Montessori is a celebration of this goal, as much as it is a work in progress. Every year the Science Fair unit is different. Teachers cannot prepare for this unit as they do for others. Though we have organized our expectations differently throughout the years, the projects and the enthusiasm must be student-driven. If the students are to create the hypotheses and conduct the experiments, collect the data and make the graphs, then they must feel invested in the topic. In the past few years, we have moved from expecting the majority of the project to be done at home to helping them complete the project at school. Due to the restraints of space and materials, some procedures are still conducted outside of school, but a minimum of two class periods per week are dedicated to the scientific process in the months leading up to the Fair. Discussing theories and researching the scientific terms involved in each experiment gives the students the background knowledge to feel confident speaking with others about their projects. In the weeks leading up to the fair, many students carry out their procedures at home and return to school with data to compare with their partners. When they use this data to create graphs and to write about the results, they realize how much they have learned over the course of the project. Science Fair day is both exciting and nerve-racking. The day starts with an open house for parents and school community members to wander through the classrooms examining the posters and speaking with the students about their projects. Soon, upper class students from Falmouth Academy arrive to act as “judges,” giving our students a feel for the more formal atmosphere of a science fair. One or two judges visit each project to listen to presentations prepared by our students. As they interact with the students, the judges fill out feedback forms that we have designed for them. Later in the morning, we have the opportunity to hear from the Falmouth Academy students in a forum style meeting. They share their own experiences with Science Fair projects and answer our questions about the process, the things they’ve learned and how they’ve struggled. It is rewarding and inspiring to hear about the work of these young scientists. At the culmination of the day, what once felt like a daunting task, the many repetitions of one experiment and the weeks of study, feels like a great accomplishment. At Bridgeview Montessori School, we have full faculty meetings the first Tuesday of every month. On the subsequent Tuesdays, our faculty meet in small groups to discuss curriculum and also work in their classrooms. We feel fortunate to have this time to collaborate and prepare our learning environments. This past Tuesday at our full faculty meeting, Sandy, our Head of School, asked us to share one thing we each love about our work. She clarified and asked that we find an answer other than THE CHILDREN ….. of course, we all wanted to say the children! “I love thinking about my planning for a one on one lesson with a particular student. For me, finding just the right process with just the right materials is rewarding ….especially when that child has an ‘ah ha’ moment. “Having students for three years in the Montessori three-year cycle is wonderful. I love the relationships I am able to create with not only students but families. We really know our families. I hope you have enjoyed this Bridgeview Valentine! One of the many things I love about Bridgeview Montessori School is being able to watch empowered students see their creative ideas come to fruition. We have a pajama day because a student proposed it a few years ago. We had a school store at one point because of the initiative of two students. This year I have seen two brainchildren come alive. Most recently a Second Year student wanted to start a school newspaper. His boundless enthusiasm was contagious, and his staff, made up of 1st, 2nd and 3rd Year students, fell right into place. With an eager teacher to support the effort, we have a newspaper. Please enjoy this inaugural edition of Montessori Mingle. Another amazing activity that we now have because of a 5th Year student's initiative is a a Jazz ensemble. Thanks to this student, with the support of our Head of School, we now have a parent volunteer who leads the group during Friday recess. Our students decided that giving up their outside time was well worth it. Click to check them out! How lucky we are to work together in a school where every voice matters. Good evening and welcome to Our Children’s Winter Concert. When I first joined the Bridgeview Montessori Community, learning that the Winter Concert was after the holidays, was the best gift I was given that year. Now, it is the one I appreciate the most each year. Luckily, it is among the many gifts Bridgeview gives our family. If you are new to our group or find yourself at an especially busy period of your life, you may not be aware of the dedication these women have to their students. Going to my first parent teacher conference, I expected to hear how my child had been progressing academic and behaviorally. But that is not what happens here. Instead, I receive stories about the experiences my children are having in the environments their teachers have prepared for them. I hear about the quirks and peccadillos specific to each of my children. That is how I know these adults are teaching the whole child… Following their lead and guiding them. That is quite a gift. On the Board, I hear about the wishes and dreams of future experiences the teachers are aiming to provide. I hear about the Circle of Giving annual fund, based on the philosophy that whatever the families of students give exponentially multiplies what Bridgeview can give back. I hear how very grateful the faculty are for that. When my child makes an “Unexpected Choice,” I hear how it was handled. I hear about the care and concern that was taken to discourage the behavior while keeping that child's self confidence in tact. This is what ALL the teachers at Bridgeview Montessori do. They create independent thinkers. That is why we can add the founder of Amazon, the founders of Google, Jackie Onassis, Princes William and Harry, Julia Child, and Anne Frank to the list of many impressive Montessori graduates. Will they grow up to be confident enough to follow their passions? Brave enough to ask questions? Smart enough to have patience? You bet…..because the people I choose to surround them with believe in them. So, naturally, they believe in themselves. That is a gift every parent in this room has awarded their child. I started worrying about preschool pretty much at conception. Not my own, of course, but my son’s. After all, I was resigning my position as a public elementary school teacher to raise this child. And, in truth, it was my frustration with the stressful, impersonal environment in my current school that first planted the seed of desire to escape and start my own family. It made sense that I wanted things to be different for my child. I deeply wanted him to discover the wonder in the world around him and develop a passion for learning about it. As he began to emerge as a person in his own right, my resolve was strengthened. We had talked so much about inspiring “lifelong learners” in my teacher training, but every day in the classroom all I did was teach to a standardized test that seemed aimed at creating standardized human beings. How could I take this naturally curious child with a mind of his own and put him in that environment? As I began to consider preschool options for this curious child of mine, many independent preschools presented themselves as options, and friends recommended everything from Catholic education to homeschooling. I explored them all, but in the back of my mind there was my mother’s voice. When I was growing up she had always told me that a Montessori education would have been her first choice for me. My father, a traditionalist, was against the idea on principle, so I was off to the mainstream. But my husband, also a traditional person, told me that my Masters in Education qualified me as the family decision maker on this topic. Thus empowered, I forged ahead in my quest for the perfect preschool. Many schools received high recommendations from other moms. A woman I had recently met in our Sandwich Library playgroup had an older son that went to Bridgeview Montessori School in Sagamore. When she spoke about her son’s experience, I knew I had to check it out. I had visited other schools that either felt like extensions of home play or seemed like roads directed towards traditional education. When I visited Bridgeview Montessori School, I was invited to view a Children’s House classroom in action. The moment I saw it, I knew. It felt like we were coming home to a bright, peaceful, welcoming place. This place was about learning. And work. The children were spending their days joyously exploring their work as the classrooms were filled with extraordinary Montessori materials prepared meticulously by trained Montessori teachers. When we observed the a classroom at Bridgeview Montessori, we saw materials that were colorful and engaging, not garish, but carefully maintained and meaningful. Each child was working industriously and seriously in a way that seemed incredible for a group of three or four year olds. My husband said skeptically, “He could never do that.” But I knew. Our son could do that. He craved that kind of purpose and his intellectual curiosity demanded that kind of direction. What wonderful things could he discover if he was surrounded by other children whose mutual curiosity was guided and encouraged by teachers. I was sold. I cancelled all future appointments to visit other schools and never looked back. Eli, age 14, swims for a medal at Blodgett Pool, Harvard University. More than a decade later, I still haven’t looked back. Though our now-teenage son has graduated from Bridgeview Montessori School, I can still see its benefits rippling through him every day. He retained his natural curiosity and become a middle school student who challenged himself to learn more outside of the classroom than in. In high school, I still see the ability to manage his time and workload with ease and to set his own internal expectations for excellence. At work and play, he is confident to approach new situations and tackle novel problems with innovative solutions. He learned all of that through the independence and respect afforded him in a Montessori program. We could not have made a better investment in his future than to begin his educational journey at Bridgeview Montessori School. As for me, Jessica Germain, I never returned to teaching in the public school. I decided to pursue Montessori training instead and am currently a teacher at Bridgeview Montessori School in the Elementary I (1st - 3rd grade) program. My husband Greg Germain is the General Manager of Accu-Seal Corporation and is proud to be raising an independent, self-confident son. Greg served as President of the Bridgeview Montessori Board for three years from 2013 to 2015. Courtenay Harrington Bailey, my friend who first recommended Bridgeview Montessori, started the popular Dramafun! program in Sandwich and became the Music and Drama teacher at Bridgeview Montessori School. Courtenay and our families remain close friends to this day. Eli Germain is an A student at Sturgis Public Charter School in Hyannis. In his spare time, he writes poetry, plays board games, and trains more than 23 hours per week for Cape Cod Swim Club where he holds numerous age group records and is currently ranked in the top 20 nationally for the 200 yard butterfly. His first coach at CCSC, Adrienne Fontes, was also his Fitness teacher at Bridgeview Montessori School. Eli will turn 15 this month. The second graders at our school recently completed their animal reports and dioramas. The goal of our lessons was to learn about how animals belong to different classes, and how those classes are different from each other. Students enjoyed exploring an animal of their choice and creating that animal’s habitat in a shoe box. The animals chosen were a humming bird, a bear (brown, black and polar), a panda bear, a whale, a bat and an owl. Students researched their animal using books found in our extensive science room library. 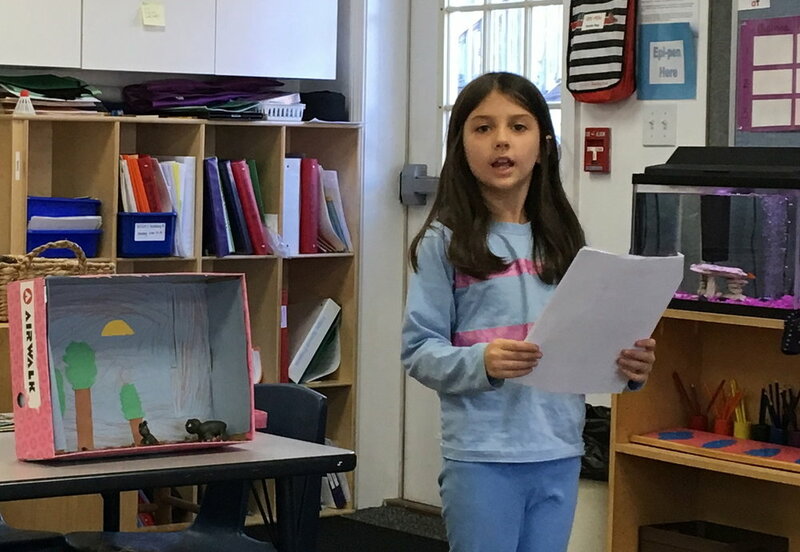 They shared their findings with their second grade peers and showcased their finished projects this past Monday for both the first graders and third graders. This type of lesson allows for students to work on many different skills: researching skills, artistic skills, problem-solving skills, and public speaking and presentation skills. I am always amazed at how well our students can think outside the box and create an original and interesting piece of work. Today and tomorrow, November 8 and 9, we hold parent/teacher conferences for every child at Bridgeview Montessori School. We do not have classes these days, and every parent is encouraged to sign up for a 20-minute conference with their child’s teachers. We provide care for the children while their parents are talking with the teachers. This is so very different from my experience when my daughter was in our neighborhood school. It was her Kindergarten year. She had been a student in Bridgeview’s Children’s House for the years before, but we really wanted to give the local school a chance… we had played on its playgrounds and sledded down its hills countless times, and we could walk to it on a sidewalk down a tree-lined street. Seemed idyllic! I remember when parent/conference time rolled around at that school. Having heard nothing about our turn for a conference, I asked the teacher when we were going to sit down to chat about Jane’s learning and experience. The teacher said, “She’s fine. No reason to meet.” My husband and I, both independent school teachers, were surprised by this answer. We wanted to know about her experience: did she have friends, was learning joyous for her, what work seemed of particular interest to her, did she seem confident in the classroom, what were her growing edges, were there ways we could support her psyche at home…. And so much more. Were we being THOSE PARENTS. I think not; we just wanted to hear the stories! Well, we were able to have our meeting and were met with the words, “Jane is doing fine.” We asked questions about our girl yet still feeling like the teacher wasn’t sure what we were looking for… she almost seemed defensive. Anyway, Jane did have a fine Kindergarten year, but her parents wanted more. Fortunately for us, we found Bridgeview Montessori School. At Bridgeview Montessori School conferences, teachers relish the opportunities to share stories with parents. We do our very best to communicate the richness of each child, including emotional, social, academic, and developmental facets. We want to learn who each child is at home too. Our parent/teacher conferences are a wonderful time to enhance the school/family fit. We will tell you about your child at school, his strengths and his growing edges. We will listen as you tell us about your child at home, her favorite things, how she keeps her room, her extended family. Parents leave believing that we care and that we are striving to know their children deeply and in important ways. About two months ago, I received a mailing from my alma mater, the Whitby School, where I attended from almost three to eleven years old. The Whitby School in Greenwich, Connecticut was founded in 1958 as the first American Montessori School. The American Montessori Society (AMS) began at Whitby; AMS is the same organization where many Bridgeview Montessori teachers have trained and with which our school holds an affiliation. In the mailing was an Alumni Update card along with an invitation to their Founders Celebration in recognition of their fiftieth year. I started to think about my years at Whitby, realizing that it too was a young school when I was there just as Bridgeview Montessori is a young school. Preparing to write my Alumni Update started my thinking about some other commonalities. I think of the spiral. My spiral began in a Montessori classroom at age 3. My mother tells the story of my older sister going off to Whitby without me. Mom explained that as soon as I was out of diapers, I could go too. According to family lore, that was the motivation I needed; I started at Whitby soon after that conversation. I remember the cooling feel and substantial weight of the metal insets. I remember the knobbed cylinders. I always loved the littlest ones. I remember a box of chocolates being taken from my open cubby and the community meeting that followed -- every member of the community sitting on the steps of Caedmon Hall to discuss trust. I remember that nouns are marked with a large black triangle when using grammar templates to identify parts of speech. I left Whitby after fifth grade but was forever affected. Both my sister and I feel that our experience at Whitby was fundamental in our development. My sister and I consider ourselves lifelong learners, both earning advanced degrees, both becoming educators (to our businessman father’s chagrin), and both choosing independent schools for our children. I see my children as creative and independent thinkers who can sit down and focus on the work in front of them. I see them as forever curious and motivated -- on their way to becoming lifelong learners. To borrow a phrase from a wonderful educator friend of mine, I believe that we all have “growing edges;” we all have more to learn. I absolutely believe that my sister and I, and my children get these qualities from Montessori. My spiral has brought me back to Bridgeview Montessori School. I feel connected when I touch the long bead chains and remember that the eights are brown and the nines are royal blue. I struggled with those. I hear and I then remember the muffled jingling sound that a thousand cube comprised of ten bars makes when you lift it. When I’m giving a tour to a prospective family, I find myself touching the material, asking parents to feel it too. It is compelling. We think of the spiral as an outward and upward trajectory for our community of learners, but for me, spiraling back, down, in has been just as inspiring. I am finally getting to my Whitby Alumni Update card. Class of: I left Whitby after 5th grade, spring of 1977. Ironically, I find myself the Assistant Head of School and Director of Admissions at Bridgeview Montessori School where my children, Jane and Thomas Earley, went for 6 and 7 years respectively, both finishing Elementary II. After teaching English in non- Montessori independent secondary and middle schools for many years, I relocated to Cape Cod with my husband Mike Earley, leaving the classroom to be at home with our two children. As we were searching for a school for them, we found Bridgeview Montessori. The nostalgia I felt upon entering the classrooms was wonderful, and I knew that I wanted Montessori for my children. Just as my mother taught at Whitby while my sister and I attended, I too have joined the faculty at my children’s school. Mike served as the President of the Bridgeview Montessori Board of Trustees just as my father did while I was at Whitby. Just as my family growing up was, my family now is drawn in by our Montessori school. Needless to say, Whitby, Montessori education, and now Bridgeview Montessori are in my blood. I am so excited and proud to announce the launch of our new website, bridgeviewmontessori.org, which truly represents the very spirit of our school. We have worked hard to create a site that communicates what we do every day to cultivate creative process, grow empowered and resilient people and hold community close. Our words and photographs have been chosen with great care …. presented to inspire. Each and every person within our community has had a hand in this project. Above all, our strength rests with our community who holds our school and its mission close to heart and soul. I would like to give a special thank you to a few people who went above and beyond to help. Past parent and friend of the school, Katherine Jackson of The Mirrored Image Photography shot photographs that are compelling and tell our story without words. She visited our school over a period of several days to make sure she captured authentic moments in time. Having built a website for his children’s Montessori school, our web designer Bill Gatewood, a college friend of Suzanne’s, offered to help us build ours. He did not confine his responsibilities to our website but also gave helpful advice in how to strengthen our overall online communications. He was more than just a website designer; he became a friend to our school. Mostly I want to acknowledge and thank Suzanne Lawson, our Director of Admissions and Assistant Head of School, who carved time out of her already busy schedule to coordinate and help build the website. Her sensibilities and editing and writing skills run throughout. Her steadfast belief in our school is always her inspiration. Every day I am thankful for her partnership and support. I am honored to be the first person to contribute to our blog. It is my dream that throughout this year you will hear from each and every one of us here, and that our website will be visited often thus becoming a vital part of our community of learners. Welcome to a new school year and to our new school website. I am always yours in digging deep.